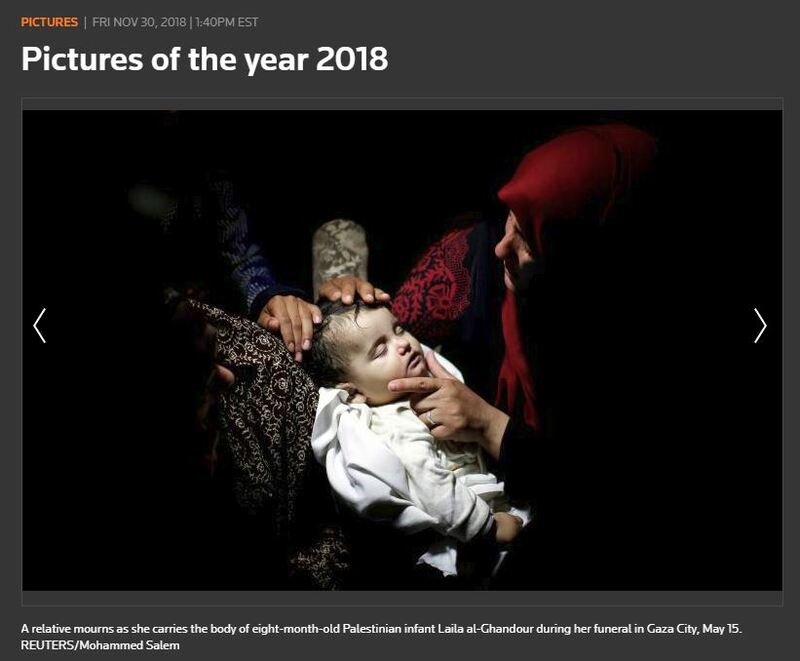 In its Pictures of the Year 2018 collection of 100 photographs published yesterday, Reuters includes an image with a caption which blames Israel for the death of infant Laila al-Ghandour, despite the fact that months ago Hamas removed her name from the list of fatalities for which it holds Israel responsible. A relative mourns as she carries the body of 8-month-old Palestinian infant Laila al-Ghandour, who died after inhaling tear gas during a protest against the U.S. embassy move to Jerusalem at the Israel-Gaza border, during her funeral in Gaza City, May 15. The Gaza Health Ministry spokesman said Wednesday that the death of a 9-month-old girl remains under investigation, two weeks after a medical official cast doubt on initial claims that she died from Israeli tear gas. A medical report issued on May 14, the day of Layla Ghandour’s death, and seen by The Associated Press this week makes no mention of tear gas. The report said she suffered from a congenital heart defect and died after her blood circulation and respiratory system stopped. When asked about the significance of the report, two doctors offered conflicting views on whether tear gas would have been mentioned if it had been suspected of having contributed to the infant’s death. Both spoke on condition of anonymity because they were not authorized to discuss the case with the media. 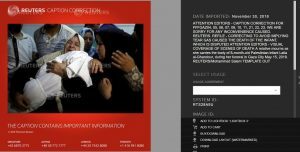 Israel claims that the leader of Hamas in Gaza, Yahya Sinwar, paid the Gaza family of a baby girl who died last month to claim that she died from inhaling tear gas that was fired by Israeli troops during mass demonstrations along the Gaza border with Israel. The allegation appears in an indictment that Israeli prosecutors filed on Thursday against a resident of Gaza who is related to the child, Layla al-Ghandour and who was caught trying to infiltrate into Israel. CAMERA has contacted Reuters to request correction. Stay tuned for an update. A relative mourns as she carries the body of eight-month-old Laila al-Ghandour during her funeral in Gaza City, May 15. Reuters issued a correction in its photo archive, stating: "Correcting to avoid implying tear gas caused the death of the infant, which is disputed." In fact, as explained above, not even Hamas continues to maintain that she died after inhaling tear gas. 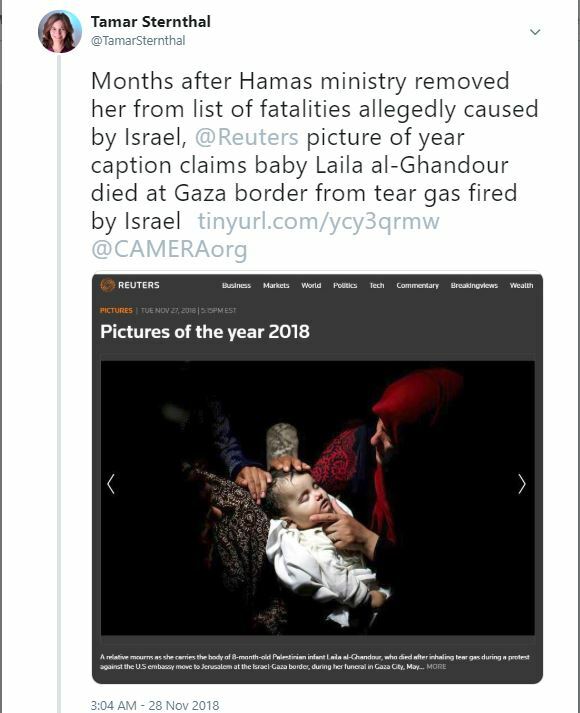 In addition, Reuters corrected a second caption for a separate photograph which had also attributed al-Ghandour's death to tear gas inhalation.